PRODUCT DESCRIPTION: Natural pyrethrin is a 1% concentrate which can be mixed in water or oil and sprayed for a wide range of insect pests. 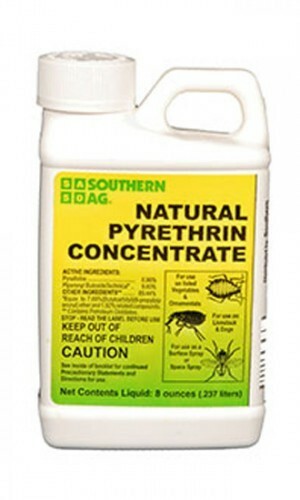 Pyrethrin is very active on insects and will knock them down quickly so its a good additive when treating active infestations of pests like noseeums, mosquitoes and gnats. Use it initial treatments of active pests along with residuals like PERMETHRIN and NYLAR. The concentrate has a slight odor but is barely detectable once mixed once mixed with water. If you have a large lot of 1 acre or more, consider getting the more concentrated 6% PYRETHRIN since you will be using more chemical throughout the season and the larger size will prove more economical. WHERE TO USE IT: Inside and outside the home and even on garden vegetables. RATE OF APPLICATION: This varies on the target pest. You may use as little as one ounce per gallon of water or as much as 4 ounces per gallon. For mosquito control, you will generally use 4 ounces per gallon.